Peony Species with their wild, botanical simplicity can hardly be compared the their highly hybridized cousins. These elegant and simple flowers are found in colors from soft pastel lavender, pink, to vibrant cardinal red and even yellow. These are plants for the more sophisticated and experienced gardener. They are quite at home in a more relaxed, bright and sunny woodland edge provided root competition from neighboring trees and shrubs are kept under control with root barriers. Why peony species are special. In many cases wild peonies are becoming more scarce and even endangered as their native habitats are changed and destroyed by the actions of people. Some that we offer are now listed as rare, endangered or vulnerable in their native habitats. Our goal at Hidden Springs Flower Farm is to provide people access to not only the genetic material of these species but also the beauty that they provide in a more botanically minded gardenscape. The emerging foliage is stunning and the seed pods with bright coral and steel blue seeds provide interest later in the growing season adding to their garden value. Most bloom a full month ahead of our common garden peonies right along with your late blooming double tulips and daffodils. Nearly all demand excellent drainage and none tolerate soggy soils so pick a spot just to their liking for success. Many of them come from alpine to sub-alpine mountain areas. There are four or five double flowered form species that are perhaps some of the oldest and most popular of all peony species grown. They are also the most easy to locate. The double flowered Fern Leaf Peony is normally one of the first peonies to bloom each year, however, there are some peony species from the Caucasus Moountains that will bloom a full 4 weeks ahead of Paeonia tenuifolia. The double Fern Leaf Peony requires a well drained soil and is perfectly at home in a situation where it can go into a dormancy in dry summers just like in it's native habitat which is dry grasslands that typically recieve little or no rain during the summer months. It does not tolerate shade and will die if grown in an area which is constantly wet from an automatic irrigation system. Plants that have been growing in no maintenance cemetaries in the Dakota's are still blooming decades after they were planted. The other three double flowered species are the pink, the red and the white colored forms of the Memorial Day Peony namely; Paeonia officinalis rosea plena and Paeonia officinalis rubra plena and the much rarer Paeonia officinallis alba plena. Known since the middle ages they are still gracing our gardens today. The Memorial Day Peony also prefers a well drained soil and a place in the garden that receives full sun for best performance. Even though books written on peonies list it as having 36 inch stems the stems are somewhat spreading and turn up at the ends so that the height in the garden is more like 24 inches tall and the plants occupy a space of about 4 feet across after a few years. The flowers are slightly fragrant and if cut when first opened may last for 3-4 days in a vase unlike Paeonia lactiflora cultivars that may last 7-11 days in a vase. PEONIES FOR THE SHADE ? There are a few peonies that actually grow fairly well in dappled shade. The amount of sun I would characterize as 4-6 hours of good strong sunshine and the more shaded the slower the growth and fewer flower stems produced. It is more difficult to establish small plants in the shade so that you will have better success if you remove some branches from shading trees for the first few yaers to get the plants well established. Most all of the tree peony species are from woodland habitats and quite at home in a dappled light, woodland setting. Paeonia veitchii grows along woodland edges and is a small plant with fine cut leaves and lavender to white flowers that typically face to the side when in bloom. The white flowered form is much rarer. 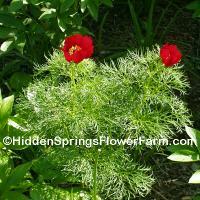 Another woodland peony would be Paeonia obovata which can develop into drifts in a woodland setting. The flowers of P. obovata are white to pale pink and although the flowers are not long lasting the seed pods are long lasting and exceptionally attractive having brilliant coral infertile seeds mixed with steel blue fertile seeds in the seed pods that persist for a relatively long time in the fall before being shed. Although not widely available yet the realtively rare species Paeonia mairei grows best out of direct sun and the resting buds are found at the soil surface under leaf litter in it's native habitat and duplicating this will ensure greater success. It does not ahve a massive root system and does not have large tuberous roots like most other peonies. If you are ready to get back to a more natural garden look and willing to take the responsibility for providing for the special conditions required consider trying a few species this year. You may even be helping preserve this wild resource as more species are lost in the wild in our changing world. WHY ARE PEONY SPECIES SO HARD TO FIND? 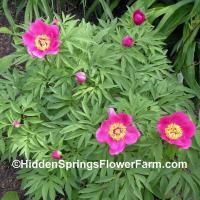 There are a number of reasons that peony species are difficult to find. Probably the first being that they are not as adapted to rapid propagation methods as the long domesticated Garden Peony, P. lactiflora varieties. The root mass tends to be altogether smaller and often the main crown is connected by a long neck that does not divide into what would be a neat 3-5 eye division. In some species the roots are more dahlia like in outward appearance and must be handled much more carefully from digging through packing and are very intolerant of being stored wet or for long periods after digging. Often times the roots of some species are not growing directly under the crown of the plant resulting in more damage during harvest which results in fewer divisions to market. Some species like Paeonia veitchii have a very tight woody crown that is very difficult to divide cleanly without doing a lot of damage. In this species case the best plants seem to be young first time blooming seedlings that have been grown to maturity which takes from 5-7 years from the date of planting the seeds. That kind of investment of time is at total odds to most nursery practices aimed at getting a perennial product to market within one year from division or seed propagation and from an economic standpoint puts them more in the range of woody plant costs of production. Considering that peonies live as long or longer than many of our woody landscape plants the investment in purchasing them is very small by comparison. Some of the species will also cross pollenate resulting in hybrid seeds and the resulting seedlings bearing characteristics of the two parents and therefore are no longer true species. This makes it necessary to grow each species of peonies in isolation from one another or doing hand pollination and covering the stigmas to avoid unwanted wind or insect pollination. Having at least two different clones of the same species results in the best seed production as some species like P. mairei seem very reluctant or unable to produce seed when self pollenated. Hand pollenating and protecting the stigmas from unwanted pollen is another costly operation in the production of true to type species requiring close attention at a time of year most plant nurseries are fully employed with other necessary spring tasks. Since peonies are very attractive to bees looking for a food source early in the spring you must act quickly to ensure the bees don't get to the flowers first and cross pollenate them as peony species will close up for the night and look like they are opening for the first time for a few days. This requires that you remove the petals and pollen bearing parts from your seed plants and you eliminate the chance to enjoy them in bloom for that year. Still with all the extra care I think of these wild peonies as some of my most loved plants. 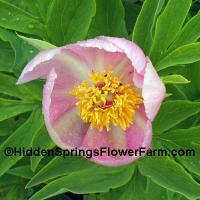 I hope you will check out our Peony Species link for detailed information on one of the largest offerings of species peonies on the web. Typically many species sell out before bloom season so check the web site in November when we update it for the coming year.